Who else is obsessing over all the amazing sales happening?! I swear they get better and better. I've even had to price correct orders because the discounts and deals continue to grow. Thank goodness for good customer service! It really is the best of the year to pick up gifts for everyone on your list, and fabulous pieces for yourself that usually never go on sale. Seriously, now is the time to buy! I cannot get enough of this yellow (it's really more of a lime green) oversized sweater and purple pom beanie pairing. I've been really into bright colors lately and both of these are super affordable. 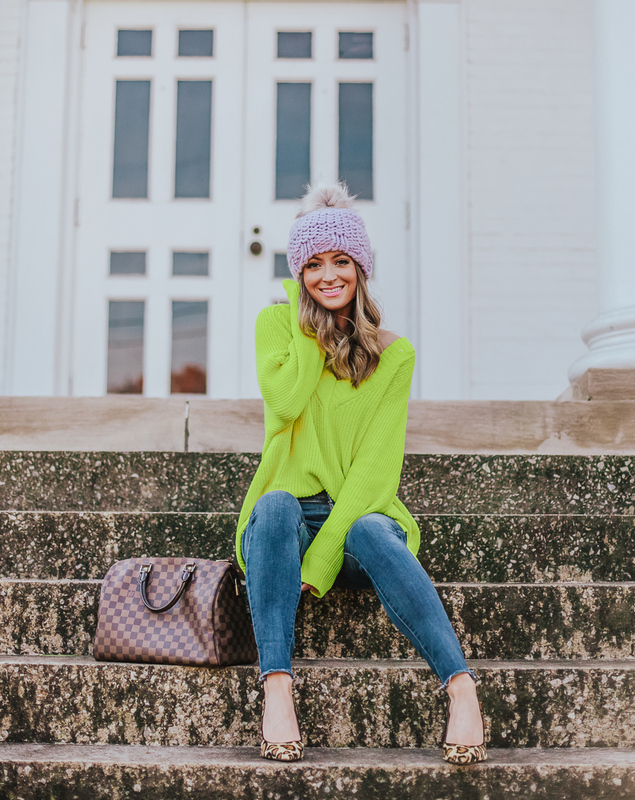 My (wearing an xs) sweater is under $30 on sale (I also want white) and my hat is under $17 and BOGO 60% off when you buy another clothing, shoe, or accessory. Such good deals happening right now! Below you'll find SO MANY amazing deals & discounts with links, info, and codes to help you shop. I don't know about you, but I've just about finished my Christmas shopping thanks to all of the incredible markdowns... and just might have snagged some things for myself (see below). Have the happiest of Cyber Mondays!! CYBER MONDAY SALES TO SHOP! ABERCROMBIE // 50% off the entire store + FREE shipping on all orders! AERIE // 50% off all sweaters & leggings + 40% off Aerie Collection + FREE shipping. ALO YOGA // 30-70% off sitewide! AMAZON // Tons of amazing discounts on devices and more! AMERICAN EAGLE // 50% off all sweaters & 40% off + FREE shipping. AMARYLISS APPAREL // 30% off sitewide with code TGIBF. ANN TAYLOR // 50% off everything + FREE shipping with code CYBERMONDAY! ANTHROPOLOGIE // 30% off everything + FREE shipping over $100! BAUBLEBAR // 35% off everything with code CYBER35! BLOOMINGDALES // Take 25% off (items labelled 25% off)! BERGDORF GOODMAN // Take 25% off previously reduced merchandise! CHARLOTTE TILBURY // Over 50% off Magic Mystery Box! DERMSTORE // Save up to 30% off with code CYBER. EBAY // Tons of Cyber Monday deals. ERIN CONDREN // 30% off sitewide! ETSY // Cyber Week sales happening now! EXPRESS // 50% off everything + FREE shipping on any order! GAP // 50% off everything with code CYBER + 10% off everything with code YOURS + FREE shipping! GOODNIGHT MACAROON // 50% off orders over $450 with code THANKS50, 40% off orders over $350 with code THANKS40, or 30% off orders over $350 with code THANKS30. H&M // 30% off sitewide + FREE shipping. HOURGLASS // $20 off orders of $125+ , $30 off orders of $150+, $50 off orders of $200+. HSN // FREE shipping + more! JCPENNEY // Extra 30% off $100+, Extra 20% off $100 under + FREE shipping over $25. J.CREW // Extra 60% off sale items + 50% off everything else with code CYBER! J.CREW FACTORY // 60% off sitewide with code ADD2CART! KATE SPADE // 40% off sale items, 30% off full price items with code MORECHEER! LOFT // 50% off + FREE shipping with code CYBER. MACY'S // Various Cyber Week specials. MADEWELL // 25% off your purchase with code SHOPALLDAY. MARC FISHER // Take an additional 25% off sale with code CM18. MARK & GRAHAM // 25% off everything (including sale) + FREE shipping with code FRIENDS! NEIMAN MARCUS // Extra 25% off sale + $50-$750 gift card with regular price purchase with code GC4YOU. NORDSTROM // The SCORE event! Up to 60% off! + Up to 40% off designer clearance sale! OLD NAVY // 50% off everything + FREE cozy socks! POTTERY BARN // 25% off regular priced orders + FREE shipping with code CYBER. QUAY // 30% off sitewide with code BRIGHT30. QVC // Cyber Monday Spectacular! REBECCA MINKOFF // 20% off $100+ with code THX25, 30% off $200+ with code THX30! SEPHORA // Up to 50% off! SHOPBOP // Take an additional 30% off sale items with code WOW18! STEVE MADDEN // 30-40%% off + FREE 2-day shipping with code CYBER! SOLE SOCIETY // 30% off sitewide. SPANX // 20% off the entire site + FREE shipping. SWEET WATER DECOR // Take 40% off everything with code FROSTY! T3MICRO // 25% off everything with code MONDAY18. TARGET // Extra 15% off Target.com + 60% off BOGO clothing, shoes, accessories! THE DAILY EDITED // 10% off all orders. THE PINK LILY BOUTIQUE // 30% off sitewide with code PLBCYBER30! THE STYLED COLLECTION // Use BF20 for an additional 20% off! TORY BURCH // 30% off $250+ with code THANKS. TULA // FREE Kefir Cleansing Oil with $40 purchase! URBAN OUTFITTERS // $50 off $150, $25 off $100, $10 off $50. WALMART // Various Cyber Monday sales happening now! WAYFAIR // Black Friday Blowout up to 80% off!